Offline : from 13th November 2018 onwards at NSD Reception from 11 am to 1 pm and 2 pm to 5 pm and if available at the auditorium an hour before the show. Entry to the show will be on first-come first-serve basis. Parking is not allowed inside & around Bahawalpur House. 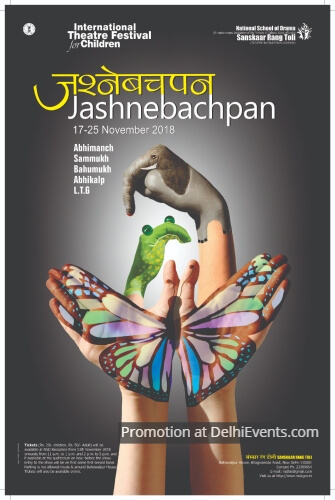 Event Details : National School of Drama Sanskar Rang Toli Presents "Jashnebachpan" International Theatre Festival for Children.